Mezzanine floor is also called multi tier racking and steel platform. It can maximum storage space especially in height direction. Mezzanine floor have several tiers to storage more then normal racking and shelving system. We can use forklift, lift platform to lift the cargo on second & third floor. Usually we use pallet truck to move cargo on the mezzanine. Usually we use heavy duty pallet racking or medium duty longspan shelving as the frame support the mezzanine, for light duty mezzanine we can also use boltless shelving. Steel floor or steel grating is the most common for mezzanine. Mezzanine floor is widely used in auto parts, 4S shop, electronic or textile industry. 1. Mezzanine floor can help increase the storage space in height a lot, which also maximum storage space. 2.Mezzanine floor have special steel floor which have strong loading capacity. The surface is even and easy to lock. 3. It’s easy to install and relocation, the structure is reliable also looks beautiful. 4. Mezzanine floor can be used to store various of different items. The application area of mezzanine floor is very wide. It’s most used in auto, electricity, mechanical and chemical industry, as well as furniture industry to store long items. 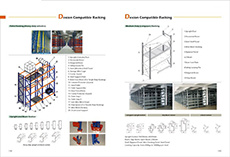 The installation of mezzanine floor is very complex compare with pallet racking. Under the help of assemble instruction, customers can build it freely without problem.